Do they have moonshine in Canada? You know, bathtub gin, white lightning, the hooch. If they do then today’s Nice Price or Crack Pipe custom Canadian-located Chevy pickup would make a pretty sweet rum runner. That is, if its price isn’t too loonie. When David Bowie sings about Young Americans, he definitely isn’t talking about yesterday’s 1985 BMW 745i. The car was neither young, nor - being a gray market import - really American at all. Still, some point it was slung to Maryland ( allllllll night, she was slung to Maryland), and both its presence and price had 72% of you singing its praises, giving the big Bimmer a Nice Price win. There have been a lot of singers that have come from Canada, some of them almost universally considered significant talents - K.D. Lang, Stompin’ Tom Connors - while others have fallen on the other end of the spectrum - Just-insane Bieber, Celulite Dion etc.. One Canadian troubadour who became famous for both his voice and love of drink is Gordon Lightfoot, he of The Wreck of the Edmund Fitzgerald fame. Gordon was once such an avid drinker that he even has a brand of Gin named in his honor. Okay, I made that last bit up, and in fact Lightfoot took time to sober himself up before each tour by making cold turkey canoe trips into the rustic wilds of Canada, communing with nature and fighting both the current and the DTs. He eventually gave up drink entirely and took up fitness instead, trading the gin for the gym. Today’s 1941 Chevy Pickup, located in Burns Lake area of British Columbia (named to prevent confusion with Columbian Columbia) could be yet another old Canadian that might become beloved. Ratted out and wearing a bed so short even Tyrion Lannister would find it unaccommodating, this truck strikes a nice balance between the mundane and the extreme, a very Canadian thing to do. Power is provided by a more modern but not too modern motor- a 350 cubic inch SBC. That’s mated to a THM400 which should be up to the task. Coolness points are awarded to the lakester headers and the fact that the truck's chrome has been kept to a minimum. Like any good homebuilt the front end is old Mustang, while out back a Camaro has served as donor for the rear axle. Keeping the theme of parts diversity, the bullet tail lights are modded off of a ’59 Caddy. On the inside it’s appropriately ratty, with the notable exception of the seats which are modern and mouse fur covered. I’m sure they’re comfortable as all get out, but they remain the most incongruous aspect of this otherwise well conceived rod. If I could read your mind, Jalops, what a tale your thoughts could tell. Since I can’t you’ll just have to vote to tell us whether or not you feel this Canadian cab is worth its $7,000 (Canadian) asking price. I case you were wondering, that’s aboot $6,695 American, eh. 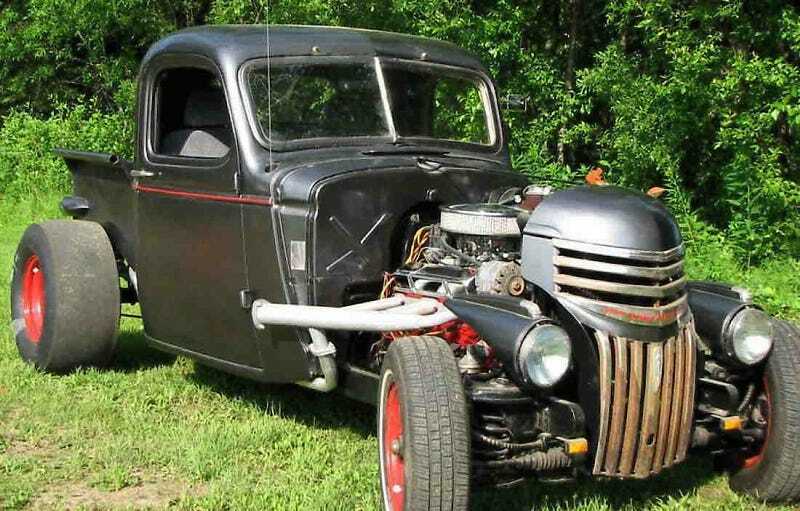 What do you think, is a cool seven grand a deal for this hot rod? Or, does that price make this truck a rat trap? 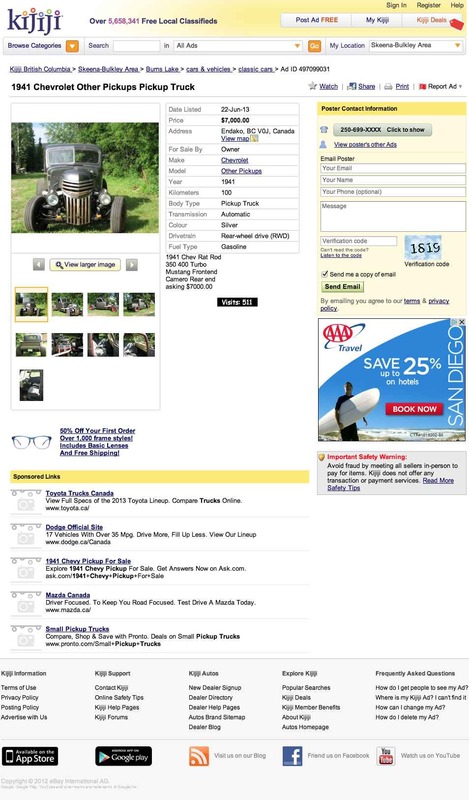 British Columbia Kijiji, or go here if the ad disappears. H/T to higginst for the hookup!